That's right. Everyone's favorite television scientist is returning to Broadway for the first time since his hilarious performance as Elwood P. Dowd in Harvey. However this time he will be playing a character that is truly "out of this world". An Act Of God which is written by thirteen-time Emmy winner David Javerbaum (The Daily Show with Jon Stewart) will star Emmy winner Jim Parsons (The Big Bang Theory) as God. Perfect casting don't you think? I mean after all his character on "The Big Bang Theory" thinks of himself as almost "God like" at times. FYI for those of you who have never watched the show you are missing out. But enough about "The Big Bang Theory". You came here to get more information on a new play on the Great White Way. Previews for An Act Of God are set to begin at Studio 54 on May 5 with opening night scheduled for May 28. The show which will play a limited engagement thru August 2 is being directed by Tony winner Joe Mantello (Wicked) and will co-star Christopher Fitzgerald (Wicked, Young Frankenstein) and Tim Kazurinsky (SNL, Police Academy) as Angels, Michael and Gabriel. Now for those of you who would like a little more info about An Act Of God here is a little synopsis about the play from the show's website. Enjoy! "Based on the critically acclaimed book The Last Testament: A Memoir by God, An Act of God is a ninety minute new comedy where the almighty and His devoted angels answer some of the deepest questions that have plagued mankind since Creation. He's finally arrived to set the record straight......and He's not holding back. Sounds fun don't you think? Now for those of you who want tickets to see An Act Of God you are in luck. We sell them. Well that and every other show both On And Off Broadway. 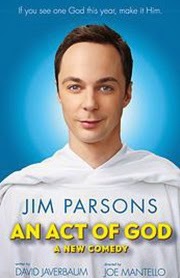 Get your tickets to see An Act Of God starring Jim Parsons at Studio 54. You won't want to miss it. Until next time theatre fans.